As we head into Week 11 of the fantasy season, it’s time again to look at the committee backfield situations around the league. Before Week 11 gets underway Thursday night, let’s take a quick trip down not-too-distant memory lane and the topic of handcuffs in fantasy football. It’s a much debated topic in fantasy circles, and with Le’Veon Bell now officially sitting out the entire season, James Conner cements himself as basically the ultimate late-round handcuff for 2018. While Bell-Conner has been a unique situation, the current fantasy leaderboard offers an interesting, and perhaps much needed, case of revisionist history. Todd Gurley, although he once managed only 3.2 YPC in 16 starts, doesn’t fit the bill for this category. But just last summer, Alvin Kamara was drafted outside the top-50 running backs with Mark Ingram coming off his best season. Rounding out the current top-12 fantasy RB leaderboard are James White, T.J. Yeldon, Tarik Cohen, Adrian Peterson, and Tevin Coleman. None of those guys entered 2018 as the presumed starter for their respective squads. Within the season, we’ve seen yet more names emerge to head up backfield committees and become fantasy starters, from Kerryon Johnson and Aaron Jones to Matt Breida and Phillip Lindsay to Nick Chubb and Latavius Murray. All of those guys were featured in this space back when they were still widely available. By and large, “Zero RB” fantasy drafters and shrewd waiver managers are playoff-bound, but the work is far from done. Before we dig into the top three running backs who are trending up or down for Week 11, let’s take a quick look at how things panned out for the players discussed last week. Notes: Johnson’s snaps were cut in half from the previous week, but he salvaged his day for fantasy owners with his third touchdown of the season, all coming in the last two weeks. … Lewis played the lion’s share of Tennessee’s backfield snaps but didn’t need to shoulder a heavy workload in a blowout win over New England. … Of RBs with at least 50 carries, only Chris Ivory is seeing fewer yards before contact than Freeman (0.66), who is generating a healthy 3.7 yards after contact. Freeman is due back from a high ankle sprain this week in what will be his first action in a month. … Michel was not targeted in the passing game and played only 18 snaps to James White’s 42. Don’t read too much into that, given it was a rare negative gamescript for New England as well as Michel’s first action after a three-week absence. … Well, then, Breida looks to be back to full health. Adams first debuted in this space a couple weeks ago as the guy most likely to seize the upper hand in the Eagles’ three-man committee. Not only has Adams taken over the lead gig on early downs, but coach Doug Pederson confirmed this week that Adams will get more carries moving forward, noting the rookie’s improvement each week. Adams is averaging 6.3 yards over his last three games, albeit on just 20 carries. Despite only 27 carries, Adams has more runs of 15-plus yards (4) than Corey Clement, Wendell Smallwood, and Jay Ajayi. All told, he is sporting a 33.3% missed tackle rate and an average of 3.2 yards after contact. Combined with the Eagles’ offensive line and their No. 7 run-blocking grade, Adams has the look of a solid flex option in all formats. And while Pederson prefers not to load all of the backfield carries on one guy, he surely would like to run the ball more than the 16 times they did against Dallas. Seahawks coach Pete Carroll warned us last week that the breakout was coming for Penny, and the rookie came through with 108 yards and a touchdown on 12 carries. Naturally, Chris Carson returned to practice this week, prompting Carroll to pump the brakes on Penny. OC Brian Schottenheimer tossed some water on the fire by confirming Carson as the Seahawks starter and noting that Penny was still trying to pick up the offense. At the very least, Penny’s dynasty arrow is pointing back up after a rocky start to his pro career. Since Week 4, he’s averaging 6.2 YPC, with 3.9 YPC coming after contact. For the season, he is getting an average of 1.7 yards before contact, and 3.0 yards after contact. On Sunday, he saw all of the third-quarter action over Mike Davis, who did not touch the ball again until late in the fourth. A likely outcome here is that Penny overtakes Davis – who has been quite solid in his own right – as the “1B” behind Carson’s 1A, with Davis mixing in occasionally. Although we don’t have much a sample size to go on for rookie Samuels, all 13 of his touches this season have come over the last three games. 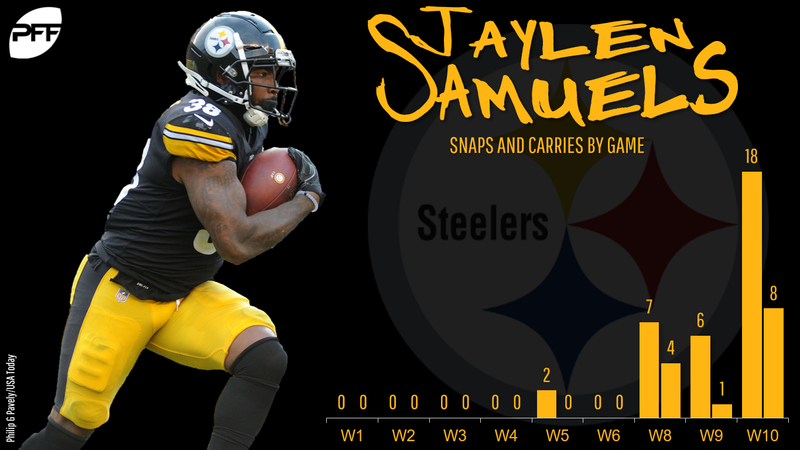 His 18 snaps Thursday night were more than he had totaled all season to that point, and he punctuated the Steelers’ scoring with a six-yard touchdown catch on the first play of the fourth quarter. More importantly, Le’Veon Bell no longer looms as a roadblock to touches, although James Conner (concussion) returned to full practice on Wednesday. Samuels (6-0, 225) played a hybrid TE/WR/RB role at NC State, and he was one of most productive slot weapons in this draft class. The Wolfpack utilized his versatility as both a traditional runner and on jet sweeps, as well as to create mismatches in the passing game. Steelers coach Mike Tomlin said this week the arrow is continually pointing up for the fifth-round rookie. He figures to remain a part of the weekly game plan Thursday behind PFF’s top-ranked O-line, creating some insurance stash appeal for Conner’s fantasy owners. Since his historic 219-yard rushing outburst against Indianapolis in Week 6, Crowell has averaged just 2.8 yards on 57 carries. He’s failed to crack 50 rushing yards in each of the last five games and has forced a missed tackle on only 10.5% of his carries in that span. Granted, the Jets’ O-line and its No. 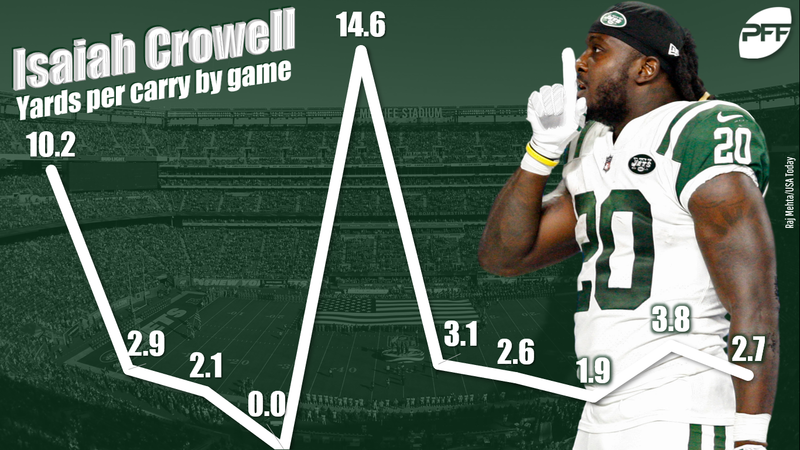 26 run-blocking grade deserves a fair share of the blame, but the only thing that salvaged a 19-yard day on the ground last week for Crowell’s fantasy owners was a short touchdown with the Jets trailing by 28. Meanwhile, Elijah McGuire played more snaps for the second time in as many games since returning from IR. McGuire forced three missed tackles on his nine touches this past week and now has 11 targets to go with 60 yards on 13 carries. Over that same span, Crowell has seen four targets while turning 20 carries into 68 yards. Also of note, the Jets have emerged as the favorite for Le’Veon Bell’s landing spot, and the team would save $3 million in cap space by releasing Crowell before June 1. Over his first two pro seasons, Richard averaged 5.5 yards on 139 rushes and was PFF’s third-most-elusive RB as a rookie in 2016. When Marshawn Lynch was lost for the season last month, Richard seemed to be in line for an increased workload. However, that simply has not happened as his snaps and touches have remained on par with what they were pre-Lynch injury. What’s more, Richard boasts only a 13.6% missed tackle rate this season despite often being schemed to get the ball in space. And granted, it’s a minuscule sample size, but he’s averaging only 3.2 yards on 18 carries and has gotten only one attempt inside the 5-yard line all season. But that’s kind of the point: Raiders coach Jon Gruden continues to lean on Doug Martin between the tackles behind an O-line that ranks No. 22 in PFF run-blocking grade. Basically, any hopes of Richard becoming last year’s version of Duke Johnson (PPR RB11) are gone. For one reason or another – ahem, Frank Gore – it’s just been a tough year for Drake. Drafted as a fantasy RB2 mostly for those two games last year that saw him go over 100 rushing yards with 20-plus carries, he has not reached 15 carries in game all season. Over the last two weeks, he’s put up only a combined 36 yards on 11 carries. Gore has dominated the work in that span with a 36-17 edge in touches, and the ageless veteran is coming off a 100-yard game in which he avoided seven tacklers on 13 carries. On average, Drake has been given more yards before contact than Gore (1.91 to 1.32) but is generating less yardage after contact (2.7 to 3.2). He also has gotten only one carry inside the 5 all season. The Dolphins own our No. 30 run-blocking grade and are minus both starting tackles. Outside of a bye-week or injury replacement, there isn’t much of a case for Drake to still be owned in 94% of ESPN leagues.